One of the stars of the Los Angeles Auto Show will be absent next week at Detroit's big event -- along with the Chicago and New York shows later this year. It's a shocker because the Cadillac Urban concept is a real head-turner, and I believe, a brand-builder. The Urban is Cadillac's sleek two-door concept that seats four and by Cadillac standards is small, really small. The concept is shorter than the Mini Cooper. But give credit to General Motors' designers in California. The overall styling creates the illusion that the Urban is larger than the British icon. The Urban concept - Cadillac's take on luxury transportation in the city center - won't be on view at major auto shows this year. Besides the Urban's styling and un-Cadillac size, the other talking point is the unexpected powertrain -- a fuel-sipping, three-cylinder engine. Cadillac's message is clear: Higher fuel economy regulations and potentially $4 or $5 a gallon gasoline will change the way we look at luxury cars. The concept was developed with the urban dweller in mind, hence the name. This is a buyer who navigates narrow side streets, wastes time looking for a big parking space for his or her luxury car and wants better fuel economy in stop-and-go traffic. A small, fuel-efficient four-seater makes sense. The Urban is also a clear signal to BMW and Mercedes-Benz that Cadillac has something up its sleeve, potentially targeting similar-sized cars planned by those German automakers. The Urban debuted the night before the L.A. Auto Show press previews amid lots of hoopla. The setting was outside GM's styling studio in suburban L.A. Several hundred people were invited. Jay Leno was in the crowd. After such a spectacular unveiling, a high-profile concept usually hits the auto show circuit. Not this time. 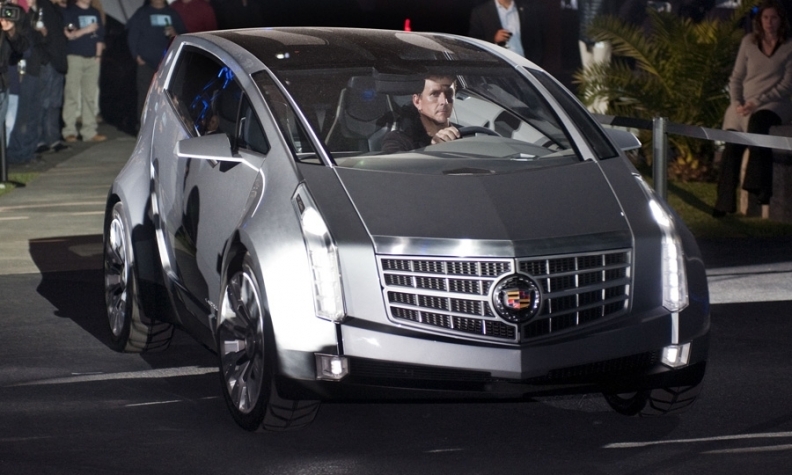 A Cadillac spokesman says the Urban concept is not currently planned for the Detroit, Chicago and New York shows. The car was created by GM's California studio as a celebration of its 10-year anniversary and with the L.A. market in mind. Cadillac was looking for feedback specifically from the L.A. market, I was told. Cadillac does not have a press conference scheduled at the Detroit show, meaning a world debut is not planned. For show patrons, the Urban would have been a good attention-getter to draw patrons to the Cadillac display. And the concept would have generated positive talking points about Cadillac's future.